All you have to do is click 'add title' and make your own list with whatever Title game you want, could be the #1, the #5 or completely unrelated to anything. Be as creative as you want. If you would like, you can also add any explanation as to why you picked what you did. Let the debate begin! This wasn't too difficult, since I've only played 6 of the games on your list. #1 Carcassonne - The only game on that list that I own, and my most played game. I also own every expansion for it (Windrose coming soon), and is one of the earliest games I got when I jumped into this hobby. I like how it plays at all player counts, and I like the way expansions added to it in different combinations can add subtle changes, or make it vastly different. It is simple enough for players of all types, but becomes very cut throat when the experienced players get together. Great game. #2 Agricola - I really like worker placements, though I never got this one since I already had plenty of heavier WP games by the time I got around to trying this one. I did get it's littler brother though, All Creatures Big and Small. #3 Automobile - Another heavy game I enjoyed playing, but never got myself, due to fear of it being too samey on repeated plays. But I think it's great with its tough decisions to take on now and then. #4 Seasons - A fun game that I could see enjoying more with more plays, since knowing the cards is crucial to being able to compete against experienced players. Downtime is a bit long with 4. #5 King of Tokyo - A couple of friends have this one, so I've played my share. It's simple to play and plays fast, but is pretty brainless. The other game I played on your list which would make it #6 is Ghost Stories. 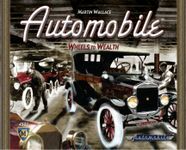 1) Automobile: A great economic game from Martin Wallace. Everyone I've introduced it to enjoys it. 2) Ghost Stories: My favorite co-op game. Many, many fun memories and close calls. Best with White Moon expansion. 3) In the Year of the Dragon: My favorite limited action game. Hard choices abound. And, it's a Feld! 4) Carcassonne: Still the best of the tile games. Popular with many wives as well. 5) Panzer Leader: Cheating a bit here since my first wargame was PanzerBlitz. But both were great AH games for the time. I've played only 4 of the games, so minus 1 TOP. The most interesting thing - I've played this game only once, but it was great. Very long (but it was learning the rules game), but great. I don't own it, so not much possibility for me to try it again. I am not a fan of cooperative games, but this one (and Robinson Crusoe: Adventures on the Cursed Island) work well for me. I like the theme, art and tough gameplay. But the main thing I enjoy is how you want to immediately start another game after getting but kicked. Always so many ideas in the air, what could've, should've and would've we done different. As my girlfriend used to say - this is a classic every gamer should have in collection. Whether he likes it or not. The game's OK, but I can't say it is even close to my favorites. Can be played time after time, especially with non-gamers as a gateway. I've never enjoyed Agricola so much as almost everyone else. Actually I like the theme, but game just don't click for me and stands with sable 6 rating from me. I have played these games on your list. I own LnL Band of Heroes, but haven't played it). Band of Brothers: Screaming Eagles - Incredible realism with few rules. What sets it above CC:E is that you also have vehicles and you don't need a fire card to fire. A Few Acres of Snow: When people mention the hammer, give them the finger. Just make a gentlemen's agreement not to use it and you'll have lots of fun. Battleline: Knizia's best, if you ask me. King of Tokyo: I like Yahtzee games and monsters, so there you have it. Panzer Leader: Respect for the old school! Actually, I like all of those games listed above except Agricola, which is a flaming bag of poo, but the others are pretty good. I chose The Manhattan Project because its the game from your list that I most want to try. I believe this is the most playable and realistic tactical WWII combat game ever. Elegant system, simply and accurately captures the reactions of men under fire. Lots of rules, but most can be ignored in the average game. Cross of Iron expansion is a must for full enjoyment. Physically beautiful game. Simple rules, but with engaging strategy decisions. Very portable if you lose the box and the (inadequate) scoring track. Recommended. Virtually all of my recorded plays include the Inns and Cathedrals expansion, which adds additional depth to game strategy. An early attempt at the Squad Leader concept. While the use of Occupation, Minor Improvement and Action cards creates many permutations, ultimately I found the game a bit boring. Precisely because of the randomness introduced by all of the cards, it becomes difficult to formulate long-term strategy, and play becomes more tactical, as players react to changes in circumstances which can sometimes be hard to predict. Victory conditions requiring a balanced farmyard seem to sap the game of interest, homogenizing strategies and making the game feel like a rather dry exercise in resource optimization. The very appealing animeeples and veggimeeples were not enough to generate much excitement. Playing the game is fun, but fiddly bits and numerous options make for work as well, and the latter almost overshadows the former. At least for us, the claim on the box that it takes 1/2 hour per player is ridiculously inaccurate. We find that about 1 hour per player is more accurate. In all, a mildly interesting game with fabulous production value, but not worthy of the lovefest it has engendered here on BGG. 1) MOI - nice tactical coverage of an era that too long went largely ignored. 2) Carcassonne - light game which can really shine in two. but beats out the few other games that I've played. the bottom of the barrel. ASL's historical modules are much better. 5) Panzer Leader - I dislike this one, but that's all we gots. likely rank at #2 out of these. Chances are Europe would too. Automobile. Say #4 overall then. I doubt that I'd want two COIN games though. card/wargamish things. Definitely above SL and PL though. Agricola - very interested in this one, but I might well end up hating it. Several on your list I have not played yet. We should get together and play sometime. 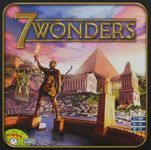 I know, it's not on your list, but everyone should own 7 Wonders. 1. Agricola - fantastic worker placement game with tons of replayability due to the vast array of cards available! 2. King of Tokyo - Fun and accessible game, one of the new gateway games. It is the cards that make the game fun, similar to above. 3. Sentinels of the Multiverse - the definitive superhero game if you want to play as a superhero. Lots of different heroes, villains and environments means the game scales well depending on the challenge you want. 4. Up Front - a revolutionary game during its time which captures the fog of war feel of tactical combat better than it's board game counterparts. 5. Squad Leader - classic wargame which was the benchmark for squad level combat for decades. I've played all of these games, although I haven't touched wargames for a long time. I primarily like my AT games but there's a few good ones in your collection. 1. Sekigahara One of my favourite games and by far the best block wargame doing the rounds. Fascinating period of history in a fascinating country. 2. Carcassonne Vanilla Carc is my favourite version and it can be played as cut-throat as you want it to be dependent upon your gaming group. 3. Strike of the Eagle Another great block wargame, albeit one I don't own and would like to play more often. 4. Zombie Dice This is great for my friends kids, especially watching them try to cheat when they roll badly! The only one I have played on your list! My hunch is that for a top 5 out of this, I would probably round it out with Panzer Leader, Agricola, and A Few Acres of Snow. Not sure how they would all rank. I'm guessing "Snow" would go higher than Carcassonne, with the other two going lower.